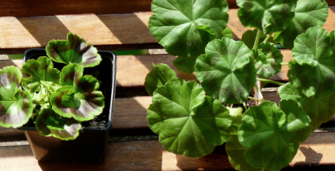 The effect of environment on geraniums: the one on the right is kept inside and the other one outside. The nature and nurture debate around giftedness is very alive. Contrary to common belief intelligence is not fixed. According to Tannenbaum (2003) intelligence is a continuously ongoing complex interplay between nature and nurture, between a person’s innate abilities, personality, personal circumstances, social environment and chanc. Intelligence is like a muscle; if you don’t use it, it loses strength. If it is used, neural connections in the brain are changed in responses to environmental cues and intelligence will grow, developing most strongly during childhood (Garlick, 2002). IQ (intelligence quotient) isn’t fixed either. It can change during a lifetime of a person, stimulated by learning a new language or a new exciting challenge, or it can diminish by living in an environment without any need for intelligence (Holland and Rabbit quoted in Wood, Littleton & Oates, 2007). Expectations, negative or positive, can determine a child’s IQ more than one would expect, especially for children with the tendency to adjust, most often the girls. Was said by the younger sister of a male prodigy. Her own imagination expressed in bleak scenarios made her an absolute underachiever, far below the general norm of age peers. She thought it wasn’t worth a try because she thought she could never live up to her own (and maybe also others) expectations anyway. She was convinced intelligence is fixed and determining the personal value of a person. It was a long road for her to regain her self-esteem by getting in contact with her own intrinsic motivation and enjoying the use of her own abilities. To her surprise, her IQ increased as expected.